*I've come to know a certain knock on my door. If it goes "slap, slap, slap/pound POUND POUND POUND!" it's my neighbor Shannon. On Saturday morning I heard this combination, and having already chatted with the skinny five-year-old with a Whoville smile earlier I decided to ignore it. I was cleaning my house and very concentrated on this task. I even told her that I would be cleaning all morning and though she asked to help (help? riiiiight) I explained that this was something I needed to do all by myself. But on her third try of nearly punching out my glass door, I opened it up to her surprise. "You have wasps on your doorstep." She said serious as a surgeon. "So sorry." I quickly said, though not totally genuine because I wanted her to NOTE THE RUSH IN MY VOICE, the THIS-BETTER-BE-QUICK tone I reserve for moments like this. "Look!" She said pointing to her shoes. "They are for kindergawten!" 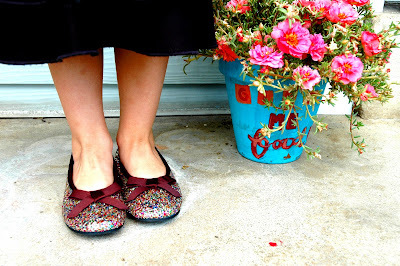 Indeed they were kindgarten shoes, flats that looked like they were dipped into a large vat of multi-colored glitter and tied with a brown fabric bow. "You should take a picture." She urgently suggested. There must be a piece of heart shred in my ribcage, because I obediently went to get the camera. When I returned she was self-posed and ready to go. As I took the ordered photos I asked Shannon if she knew what kindergarten class she was going to be in. "I was going to be in the red class, but my Grandma is going to see if I can switch to the blue class." "Why?" I asked out of curiosity. "Because the teacher of the red class looks funny." And a girl with glitter shoes most certainly cannot have that. *At one point this weekend Chup and I found ourselves the only couple in Thai Chili Garden not inseminated. Even the hostess had a full baby belly. This only bothered me when I had to use the restroom post-meal, and just as I got up to do so, so did all the pregnant women. Though I was faster than all of the waddlers, I let them go ahead of me out of respect. But yes I did hope (while waiting in line) that this was a heaven-sent analogy about me just "waiting my turn." * When Chup and I went to Wal*Mart (don't think less of me) to get some tokens of American prosperity, I noticed that Chup and the Grandma Greeter where wearing the same outfit (as you know, my favorite thing IN THE WORLD!) Navy golf shirts paired with khakis. I was so thrilled by my observation that I exclaimed outloud as we passed by her on the way out. "You two have the same outfit on!" And I used my head to point to the two of them. Grandma Greeter looked like we had just told her that her grandchildren were way cuter than the night shift's Grandma Greeter, and became so flustered that she couldn't form a proper good bye. "Oh-oh-oh gggggood....hhhave a nnnnnice day!" As for Chup he just kept walking. When we got out into the parking lot I asked if he heard me. "Yes. I heard you. Did you think it would make my day or something?" *On Saturday night, we went to the Whorehouse in Payson (don't ask) with The House of Saunders for some American Mexican food, the kind that comes out of the kitchen piping hot, and baptized in cheese. We all love it so much that we go once quarterly. The term "once quarterly" came from my last attendance at Ward Council. After the meal we all feel gooey inside, and sometimes the menfolk get toilet urgencies, but we try to make a South Valley cultural experience out of the evening. This time Davey took us to the HareKrishna temple, which is right across the street from the Kingdom Hall. Why did I think everyone south of Provo was either Mormon or Inactive Mormon or Mormon who eats American Mexican food at the local Whorehouse? Anyway, oooh boy I was wrong about that.